Property 5: McKinley House is the place to be! Property 9: Zo's Relic is located behind a 1920s home in a historic district of Amarillo. My house is located in a nice, quiet neighborhood, near a park and I-27. Property 15: My house is located in a nice, quiet neighborhood, near a park and I-27. The Roaring Twenties House at the Rock Island Rail Trail. Property 17: The Roaring Twenties House at the Rock Island Rail Trail. Home away from Home at it's BEST! Great SW Amarillo location caters to all! Property 23: Home away from Home at it's BEST! Great SW Amarillo location caters to all! Property 37: The Canyon Hideaway! 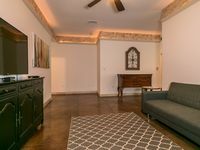 Property 44: 2 Bedroom / 2 Bath Guest House at beautiful Canyon Country Club, Canyon, Tx. “Our Nest” comfortable and secluded place to rest..
Property 50: “Our Nest” comfortable and secluded place to rest.. I have family in Amarillo and find it convenient to stay in a rental when in town. We have been staying at this property while visiting for a couple of years now. Everything works and the property is clean. Anything necessary can be had near-by. The property owners/managers have been prompt and accommodating. I vote on VRBOs with my wallet - and I keep coming back to this one! We came to visit family Amarillo for a couple days. We truly enjoyed our stay at this property. The home was very clean, nice, and had everything we needed. We also loved the style and decor. We will re-book on our next visit to Amarillo!